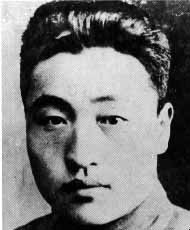 Lee Kuei-Tan was born in 1914 and was a native of the Hsin Min County in the Liaoning Province. His father died in his early childhood, and his widowed mother brought him up. The chief instructor Major Kao Chi-Hang recommended him to stay in school as an instructor. When the people in honour of Generalisimo Chiang Kai-Shek’s birthday, donated a squadron of aircraft, Captain Lee was made commander of this unit. In August 1937, Lee served as Squadron Leader of the 21st PS of the 4th PG. This unit was at the time equipped with Curtiss Hawk IIIs. On 14 August 1937, the IJNAF Kanoya Kokutai dispatched nine Mitsubishi G3M1 Model 11 long-range bombers under the command of Lieutenant Commander Nitta to attack the Schien Chiao Airfield near Hangchou and nine under the command of Lieutenant Commander Asano to attack the Kwang-teh Airfield. The Japanese planes took off from Matsuyama Airfield in Taipei at 14:50 (local Japanese time), each carrying two 250kg bombs. While Kao was attacking the No.2 plane in the 3rd Shotai, 21st PS Squadron Leader Captain Lee and his wingmen Lieutenant Wang Wen-Hua and Lieutenant Liu Chi-Sheng caught up with the no. 3 plane of the same Shotai. Shooting at the hapless G3M repeatedly, the three brought it down near Ban Shan. Later on the same day at 13:30 the Nanking Air Defence Command received a report that 16 Japanese aircraft had flown past Soochow towards Nanking. The alarm was sounded, and Chinese Air Force fighters took off to meet them. The Japanese aircraft were 20 G3Ms from the Kisarazu Ku. The Japanese aircraft had flown in directly from Ohmura in Japan and landed back at Cheju-do. At noon on 23 August the Japanese and Chinese clashed in the Shanghai area when five Hawk IIIs led by Captain Lee of the 21st PS met an estimated nine Japanese aircraft. The Chinese aircraft was flying in the Wan Chao Bin area in Shanghai in support of ground forces. Lee was promoted to command the 4th PG after Colonel Kao Chi-Hang’s death in November 1937. A group of nine I-16s flew out from Alma-Ata at the beginning of December 1937, led by Kombrig Petr Pumpur. The group flew to Lanzhou without any incidents. There they turned the I-16s over to the Chinese and returned to Alma-Ata in a transport aircraft for a new group of machines. The Chinese pilots Tun, Lo and Li (flying Hawk IIIs) led the group on to Shanghai. Unfortunately the Soviet volunteers remembered at best distorted names of the Chinese, more like nicknames; and in Chinese sources the family names of Soviet are not understood either, and are written in ideographs, and therefore it is practically impossible to establish for certain the interaction between Soviet and Chinese pilots in the vast majority of cases. But in the given situation, it is known that the leaders were the new commander of the 4th PG Lee Kuei-Tan, the commander of the 21st PS, Teng Ming-Teh, and his deputy Le Yi-Chin. From the moment of arrival of this group at Shanghai were busy with the Japanese, and by the beginning of December the entire group had been deployed together with Chinese fighter units at Nanking. He was promoted to major posthumously. At the time of his death, Lee was credited with 1 biplane victory. According to some sources he was credited with 12 victories but I haven’t been able to verify this. His name can also be spelled as Li Kwei-Tan. (a) Mitsubishi G3M1 Model 11 from 3rd Shotai of Kanoya Kokutai, IJNAF, which crashed burning near the Ban Shan area. (b) Claimed in combat with Type 89 torpedo bombers from the Japanese carrier Kaga. The Chinese pilots claimed 17 destroyed enemy aircraft but the actual losses were six shot down and two ditched in Hangchow Bay. (c) Probably claimed in combat with the Kisarazu Ku.